Welcome to Camping Eden San Felice del Benaco. The Village Camping Eden is situated in one of the most panoramic points of the South-West Garda Lake, in an area rich of traditions, history and cooking; just in front of the lake, dipped in scents and colours of a blooming nature, the Village Camping Eden is in perfect harmony with the area it places in. Tranquillity, nature and amusement are arranged here in perfect equilibrium: the Village Camping Eden can offer at the same time a relaxing but also dynamic holiday. Organised with perfect efficienty, the Village Camping Eden places at the guest' disposal a wide park with gardens, private beach, swimming pools, bungalows, mobiles, chalets, services, showers and washbasins, bar, restaurant, pizzeria, minimarket, videoroom, video-games, disco, satellite TV, cinema for children and mini club. The Village Camping Eden offers moreover typical suppers, parties, animation show for adults and children, dancing entertainments and sport activity. It assures to the customers a service of info and reservation for cultural manifestations and sports (golf, sailing, windsurf and riding). It indicates gastronomic routes to the discovery of local specialties and tastes such as oil and wine produced in the Garda Lake area, celebrated for quality and goodness all over the world, or Coltural-Touristic Routes to the discovery of the historical-artistic beauties of the place. And if all this is not enough and you look for night-life and action, then you can visit discos, pub or peculiar bars in the immediate neighbourhood of the Village Camping Eden. 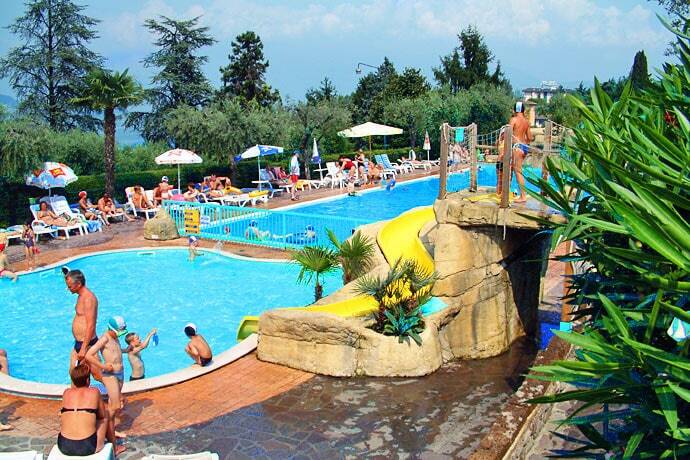 (Camping Eden San Felice del Benaco campings).